Some history books try to tell a story. Others try to turn those stories on their heads, breaking apart what has been accepted as truth in the process. 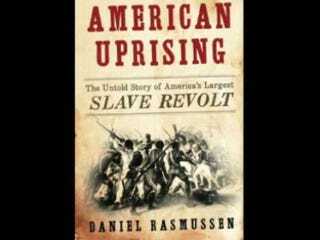 Daniel Rasmussen's American Uprising: The Untold Story of America's Largest Slave Revolt (Harper) tries to do the latter. Through his account of the little-known 1811 Louisiana slave rebellion, the 24-year-old recent Harvard grad challenges popular narratives of docile and simple slaves who seldom engaged in subversive activity to gain freedom. He does this by repositioning slave struggles in larger intellectual and political movements of the era. He also wreaks havoc on that well-worn archetype of the tragic mulatto. About the Louisiana rebellion, American historians generally have agreed on a few things: In the middle of the night on Jan. 8, 1811, a small group of slaves entered the bedroom of plantation owner Manuel Andry in his German Coast, La., home. After slaves slung a few axes and other domestic weapons, a wounded Andry managed to escape, but his son did not. The slaves then quickly seized arms and marched to New Orleans, picking up fighters along the way as whites fled in fear. The revolt, however, was quickly put down by a local militia. That's where the story splits. The official storyline that then-Louisiana Gov. William C.C. Claiborne pushed and that most historians have accepted was that the slaves were a simple band of "brigands" out to pillage and plunder. The quick suppression and subsequent un-due process in the courts proved a testament to the power of American legality in the wake of the Louisiana Purchase. But Rasmussen digs into the scant historical evidence that remains and builds a different account. The author situates the events in larger, international political and intellectual currents, revealing the sophistication of his subjects that many histories of slave rebels fail to portray. By the author's account, the 1804 Haitian revolution victory inspired slaves around the colonies to rebel. The timing of the revolt — when there was little work and the white elites were preparing for Carnival celebrations, paired with the absence of a significant force of order because of American expansionism in Spanish West Florida — speaks to the slaves' political and organizational acumen. A cosmopolitan black republicanism seems to have been ripe in the region at the time of the revolt. Maroon colonies in the bayou operated as effective bases from which rebels attacked in the years leading up to the German Coast uprising. Copies of the French Declaration of the Rights of Man were found in slave quarters. Battle-hardened warriors from Ghana and Angola also make an appearance in Rasmussen's version, in which the rebels march in formation and in uniform with cavalry support, not simply to "give us us free," as Cinqué asked, but to take control of New Orleans and establish a black state. Rasmussen's history does shift the focus from the "big house" in traditional slave-rebellion narratives, but still struggles to find those hidden voices of the washhouse in those histories. Nevertheless, he does introduce new names to the historical account. One such name is Charles Deslondes, with whom Rasmussen quite successfully transforms the tragic mulatto trope — a tormented figure torn between two worlds — into the heroic mulatto, a race savior who uses the image of and access available to the oppressor to liberate the oppressed. Deslondes, who emerges as one of the main leaders of the rebellion, is high-yella and green-eyed. Instead of enjoying the privilege that his mixed heritage affords him, working as a slave driver in Creole Louisiana, Deslondes raises arms to fight for freedom. The bedroom scene in the book, when Andry is attacked, echoes the actions of another heroic mulatto, Georges, who, despite meeting a tragic end in The Mulatto by Victor Séjour (the first work of short black American fiction), presents a symbol of heroic African-American armed struggle. Somewhat jarringly, though, Rasmussen inserts contemporary vocabulary into historical discourse with terms like "sleeper cell" and "guerilla," almost leaving the impression that slave rebellion was terrorist activity with a sympathetic objective. In that vein, the 1811 slave rebellion was a 9/11-like event that enabled the American politicians to consolidate power in a French-dominated region that had until then questioned American control. Rasmussen asserts that the following reign of white terror and militarization not only made New Orleans American but also prepared the city to take victory during the Battle of New Orleans during the War of 1812 against the British. When thinking about American Uprising and its place challenging the standard story of this rebellion, I can't help thinking of what author Edward Said wrote: "Facts do not at all speak for themselves, but require a socially acceptable narrative to absorb, sustain, and circulate them … as Hayden White has noted in a seminal article, 'narrative in general, from the folk tale to the novel, from annals to the fully realized "history," has to do with the topics of law, legality, legitimacy, or, more generally, authority.' "
By all accounts, Rasmussen's writing style is smooth; the story sustains interest throughout. The academic language left over from when the book was still his senior thesis might pique at points, but its meta-level punches on the study of history are robust flourishes. Let's just hope that wines of historical truth telling to come — like Rasmussen's — will be received with open palates by the public, as well. Wendell Hassan Marsh is a D.C.-based journalist. Find him online at the theafrabian.com.